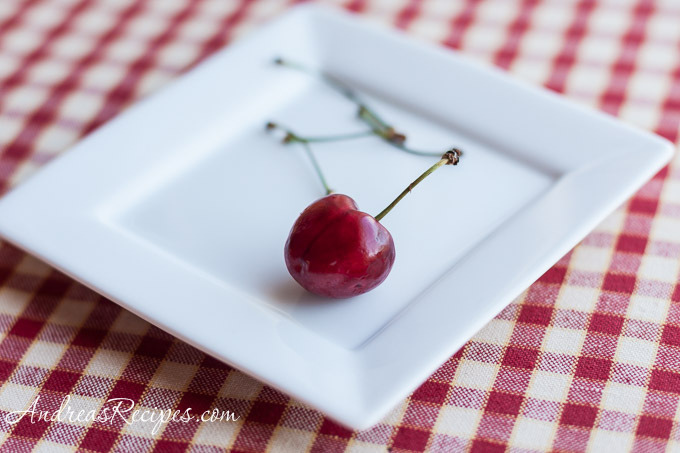 What to do with a beautiful bowl of cherries and a stash of vanilla beans on a hot summer day? If you manage to rescue the cherries before my boys eat them all, you can make David Lebovitz’s vanilla ice cream and add fresh cherries. His book The Perfect Scoop needs no introduction from me, and in fact I have a confession to make. It’s been on my shelf for a year. An entire year. I flagged all sorts of recipes to try when I got the book last summer, and then it sat. As much as we adore ice cream, one would think I would start churning away the moment it arrived, but I waited. I wanted to try out the recipes in a new ice cream maker instead of the old Donvier we’ve had for years, which only gives so-so results. My patience was rewarded a month ago when we found a Cuisinart 2-quart ice cream freezer at our local Costco at a great price (less than the online price), and Michael decided I deserved a little present for all my hard work on the taxes this year. (April was bad, you don’t want to know.) Anyway, I have put the new ice cream freezer to good use! When I was a kid, I was one of those people who would choose vanilla over chocolate, though butter pecan did reign supreme for a while. I prefer Philadelphia-style ice cream (no egg yolks) and Lebovitz’s version is delicious and very creamy. This is gone-to-heaven good, and the sweet cherries paired with the vanilla makes a tasty combination for summer. I added the fresh cherries during the mixing process, though next time I will try soaking the cherries with the cream mixture with the hope of a stronger cherry flavor throughout. The recipe calls for heavy cream, but Lebovitz says you can use whole milk for parts of the cream, and I plan to play around with this a bit trying half & half and all whole milk to see what happens to the texture. In any case, I’m glad I finally got to try this book that has been teasing me for the last year. Adapted from The Perfect Scoop, by David Lebovitz. In the medium sauce pan, pour 1 cup (250 mil) of the cream and add the sugar and salt. Scrape the vanilla bean seeds into the pan and add the pod. Stir the mixture over medium heat, until the sugar dissolves. Remove from the heat and add the vanilla extra and the rest of the cream or cream + milk. Chill the mixture thoroughly in a covered plastic container. Remove the vanilla bean before churning, just rinse it and reserve for another use. Follow the manufacturers directions for your ice cream freezer. Cherries . . . those look like amazing cherries and just made for that ice cream. I’d say this one was worth waiting for. cherries are so sinful!! 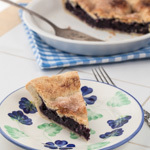 I’ve had my eye on this recipe from David’s book since last year. i love the book and have made several things from it. i recently had the book in my hands again and believe it or not was planning on making this one. perfect reminder Andrea! Beautiful ice cream and gorgeous photo too!!! Oh yeah, Cherry Vanilla ice cream – looks and sounds amazing! I made something like this last week. Used some yogurt in place of the milk and added chocolate chips as well. Very very tasty! That looks delicious! I’ve been churning out all sorts of ice cream lately. I can’t wait for cherry season here so I can make some black cherry ice cream. You can never go wrong with a home-made vanilla ice cream and I also love David’s book. 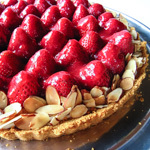 This looks delicious, especially with cherries in season now. Both me and my son just love fresh cherries! I keep buying them to use in recipes but we happily end up eating them just plain… oh so good! This looks absolutely delicious! I’ve never made my own icecream, but definitely have added fresh cherries to store-bought icecream. For a bit of variety, try sour cherries! Ooh! 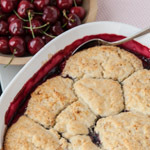 I have just enough cherries left over from making a pie (potential grow your own post right there) to make this ice cream. And I have an ice cream maker! Fabulous ice cream! 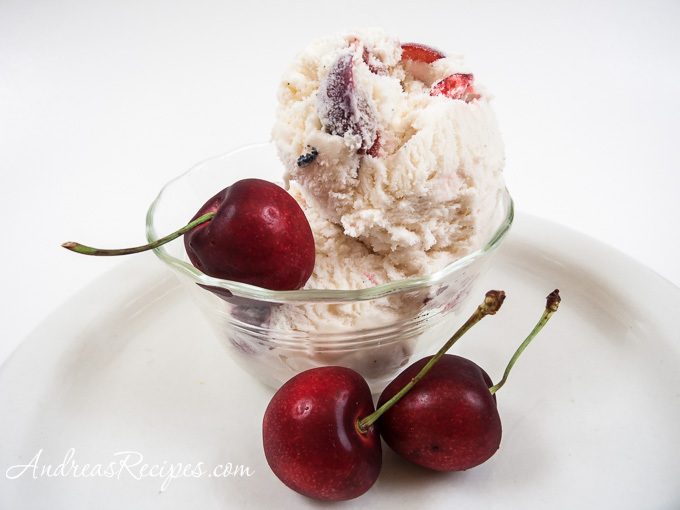 Can’t get enough of cherries in every shape or form and this ice cream turned out scrumptious! When do you add the cherries? Hi Arthur. For our ice cream freezer, you add the cherries about five minutes before the ice cream finishes churning, but yours may be different. Make sure you check the instructions for your machine on when to add fruit, nuts, etc. What if you dont have heavy cream….can i se 2 percent milk instead…or maybe even heavy whipping cream? Hi Joe. Heavy cream or heavy whipping cream will work well, but 2 percent milk doesn’t have enough fat to duplicate the creamy texture. I ended up with a bunch of Rainier cherries after having the basic Cuisinart vanilla ice cream recipe um, pre-ice cream mixture already in my fridge…but I used your post for guidance so I wanted to thank you. I pureed 1 cup of the cherries and added 1/2 tsp almond extract and added that to the cooled/cooling mixture and then chopped the other cup and stuck it in the freezer during the mixing time, to try to get them to cool down super fast. I’m not sure if that was the best idea, but I didn’t want them to melt the soft ice cream and sink to the bottom as a failed strawberry ice cream attempt did a few years ago…I just put it all in the freezer and the big bits seem suspended, so I’m calling it good for now. The puree did flavor the vanilla really nicely, but I think I’d use less milk next time as the puree added more liquid so the soft ice cream was much softer than I’d hoped…but we’ll see! Thanks again!